Washer Disinfector designed for cleaning and disinfection of surgical, anesthetic and respiratory equipment, hollowware, utensils and glassware etc . Should have facility for setting unlimited number of user settings for disinfecting various objects. Efficient dryer with a HEPA filter Class H13/14. The System should be fully automatic PLC control including back-up batteries for full memory protection. High power circulations pump of 700- 800 lit/ min. It should have LCD display & User Interface and the integrated process verification printer. At least one dispenser pump for liquid detergent. It should be certified by international standard organizations like CE & ISO. The structures are made up of stainless steel AISI 304 and acid resistant AISI 316 steel. 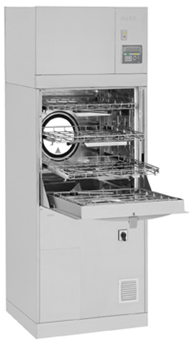 The system should be supplied with 4 removable wash shelves and 5 rotating arms.